Edmund Glaise-Horstenau (also known as Edmund Glaise von Horstenau; 27 February 1882 – 20 July 1946) was an Austrian officer in the Austro-Hungarian Army, last Vice-Chancellor of Austria before the 1938 Anschluss, a military historian and archivist, and general in the German Wehrmacht during the Second World War. Born in Braunau am Inn, the son of an officer, Glaise-Horstenau attended the Theresian Military Academy and served in World War I on the Austro-Hungarian General Staff of the Austro-Hungarian Army, where he from 1915 headed the press department of the Supreme Command of the Armed Forces. After the war he studied history at the University of Vienna, beside his employment at the Austrian War Archives (as director from 1925 to 1938). He also achieved the rank of a colonel at the Austrian Heeresnachrichtenamt in 1934. Originally a monarchist, Glaise-Horstenau became the number-two man in the hierarchy of the banned Austrian Nazi Party in the middle and late 1930s behind its leader Arthur Seyss-Inquart. To improve relations with Nazi Germany, he was appointed a member of the Staatsrat of the Federal State of Austria from 1934 in the rank of a Minister Without Portfolio, and from 1936 to 1938 served as Federal Minister of the Interior in the cabinet of Chancellor Kurt Schuschnigg, after being appointed under pressure from Adolf Hitler. At the meeting at the Berghof in Berchtesgaden on 12 February 1938 between Hitler and Schuschnigg, Germany demanded among other things that Glaise-Horstenau be made Minister of War in a new, pro-Nazi government, and that he would thereafter establish close operational relations between the German and Austrian Armies, leading ultimately to the assimilation of the Austrian into the German system. After Schuschnigg had to resign on March 11, Glaise-Horstenau served as Vice-Chancellor of Austria under Seyß-Inquart for two days. The lack of response from the OKW at Glaise-Horstenau's criticism of the Ustaše's methods increasingly frustrated him, and caused deep tension with Ante Pavelić, the poglavnik or head of the Independent State of Croatia. By 1944, he had grown so dismayed at the atrocities he had witnessed that he became deeply implicated in the Lorković-Vokić plot, with the purpose of overthrowing Pavelić's regime and replacing it with a pro-Allied government. The subsequent failure of this attempt turned Glaise-Horstenau into persona non grata both for the Croatian establishment and the Nazis. Consequently, during the first week of September, Pavelić and German ambassador Siegfried Kasche conspired together and effected his removal on 25 September. Glaise-Horstenau's withdrawal from the scene opened the door for the total politicalization of the Croatian armed forces, which occurred over the next several months. Glaise-Horstenau was then passed into Führer-Reserve and entrusted with the obscure task of Military Historian of the South East until his capture by the US Army on 5 May 1945. Fearing extradition to Yugoslavia, he committed suicide at Langwasser military camp near Nuremberg, Germany, on 20 July 1946. ^ de Baets, Antoon (2002). Censorship of Historical Thought: A World Guide, 1945-2000. Greenwood Publishing Group. p. 31. ^ Jonathan Gumz, German Counterinsurgency Policy in Independent Croatia, 1941-1944, The Historian, Vol. 61, 1998. ^ General Edmund Glaise von Horstenau to the OKW, 10 July 1941; report to Reichsführer SS Heinrich Himmler from the Geheime Staatspolizei, dated 17 February 1942. ^ Kiszling, Rudolf (1956). Die Kroaten, Der Schicksalsweg eines Südslawenvolkes (The Croats: The Fateful Journey of a South Slavic People). Graz and Köln: Hermann Böhlaus Nachf. pp. 210–11. ^ Roberts, Walter R (1973). 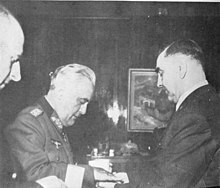 Tito, Mihailović, and the Allies, 1941-1945. Rutgers University Press. p. 111. "Glaise von Horstenau Edmund". In: Österreichisches Biographisches Lexikon 1815–1950 (ÖBL). Vol. 2, Austrian Academy of Sciences, Vienna 1959, p. 1. Peter Broucek (Eingel. und hrsg. ): Ein General im Zwielicht. Die Erinnerungen Edmund Glaises von Horstenau. Böhlau, Wien u.a. 1980 ff. Band 1: K.u.k. Generalstabsoffizier und Historiker (= Veröffentlichungen der Kommission für Neuere Geschichte Österreichs. Bd. 67). 1980, ISBN 3-205-08740-2. Band 2: Minister im Ständestaat und General im OKW (= Veröffentlichungen der Kommission für Neuere Geschichte Österreichs. Bd. 70). 1983, ISBN 3-205-08743-7. Band 3: Deutscher Bevollmächtigter General in Kroatien und Zeuge des Untergangs des "Tausendjährigen Reiches" (= Veröffentlichungen der Kommission für Neuere Geschichte Österreichs. Bd. 76). 1988, ISBN 3-205-08749-6. This page was last edited on 22 January 2019, at 01:14 (UTC).